Posted in: Home / Locations / Spain / Lanzarote / Surfing in Hawaii? No! Go to Lanzarote!! Have you ever surfed the Canarian Pipeline? Do you want to learn Spanish and surf in one of the most beautiful places in Spain? Well, you should come to Lanzarote then! Being from the Canary Islands and loving surfing as I do, I have visited Lanzarote many times, and from my personal experience, I can assure you that you will have one of the best surfing sessions of your life if you visit this amazing island. You can’t know what surfing really means until you surf these epic waves! Lanzarote is a fantastic, very beautiful and peaceful volcanic island which has some of the best spots in the Canaries, certainly in Europe, and probably in the world! 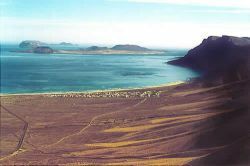 (for more info about Lanzarote, visit this page). The most popular wave is “El Quemao”, a reef break that’s been compared many times to the famous Hawaiian wave “the Pipeline”. In fact it is called the Canarian Pipe! It is indeed a very fast wave, very thick and hollow, which two sides are really good, especially the left. I highly recommend you to surf this wave if you have the chance to do it. 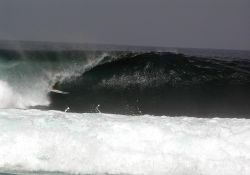 Other spots like La Santa and San Juan are also world class breaks, with really good reefs, ideal for tube surfing! But don’t feel overwhelmed, if you are a beginner and you do not have already the confidence and necessary experience to surf these kind of waves, you can just wait for the smaller days and enjoy the epics days sat on the shore taking pictures and sunbathing, or you can simply visit other spots around like “playa de Famara” or “Caleta de caballo”, much more suitable for beginners as they are slower waves. I don’t have the words to describe to you the feeling of being stuck in a tube in one of these waves – it really makes me feel alive!